Apple hasn't confirmed the existence of the rumored iWatch yet, but the company's CEO Tim Cook did call the idea of wearable technology "ripe for exploration" at a conference today. "I think wearables is incredibly interesting. It could be a profound area," Cook said at All Things Digital's D11 conference, according to The Verge. "It's an area that's ripe for exploration, it's ripe for us to get excited about. Lots of companies will play in this space." When asked if wearable technology is part of the post-PC era beyond fitness devices, Cook concurred. "Yes, I think so. I wear a Fuelband, I think Nike did a great job," he said. "I would say that the ones that are doing more than one thing, there's nothing great out there that I've seen." Of course, when he was asked about Google Glass, Cook was considerably less excited about his competitor's wearable technology product, calling it "risky" from a mainstream point of view. "I'm interested in a great product. I wear glasses because I have to. I don't know a lot of people who wear them because they don't have to." "There are some positives in the product. It's probably likely to appeal to certain vertical markets. The likelihood that it has broad appeals is hard to see." "[There's] nothing that's going to convince a kid that's never worn glasses or a band or a watch or whatever to wear one. At least I haven't seen it. So there's lots of things to solve in this space." While the head of Apple wasn't willing to out the iWatch, he did reveal that the company's longtime hardware designer, Jony Ive, is working on the iOS 7 redesign. "We recognized that Jony had contributed significantly to the look and feel of Apple over many many years," said Cook of Ive, who has been the lead designer of everything from the MacBook Air to the iPad mini. "And he could do that for our software as well," he said, calling Ive "really key" the iOS redesign, according to The Verge. Ive's iOS 7 design has been rumored to feature a flat look that gets rid of the textured patterns that makes up Apple's iOS and OS X software. Cook wouldn't confirm the skeuomorphic-free design, but did promise that both operating systems will be revealed at next month's WWDC. 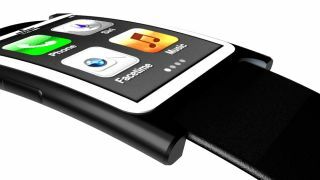 See what we think the Apple iWatch looks like.